Finally, a Book for Us Good-Looking Folks! We’re a handsome family, I am not too humble to admit. And though we take a mighty fine picture from time to time, when I see amazing family photos on Pinterest, I feel judged… Ha! No. I don’t feel judged. In fact, it’s just the opposite. I simply assume that all these families with great photos have all this extra money that they have chosen NOT to spend on the poor. Instead, they hire professionals to come out their homes with cameras and formally stage informal moments with the kids (who are all conveniently wearing matching outfits, bleh). So, when I see great family pictures, I curse everyone in the upper middle class and above, congratulate myself for making life choices that revolve around the attainment of joy and contentment (and not the almighty dollar), and remind myself that just by living in the good old US of A, our family is wealthier than most. 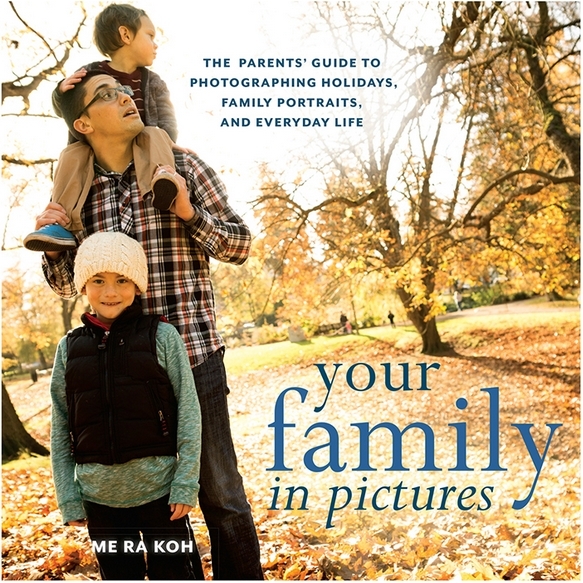 Then I turn to Me Ra Koh, the author of a couple books on taking great family photos. In the past she has pointed her pen and her lens at babies and kids. Her most recent book is Your Family in Pictures: The Parents’ Guide to Photographing Holidays, Family Portraits, and Everyday. This relatively thin tome is chock full of ideas for great photos. For example, who ever thinks to have their camera ready at breakfast? I usually have my filled with ideas about getting lunch ready and making sure the boy is wearing pants to think about capturing a special moment. It’s ideas like this that will keep you flipping through the pages and slapping down strips of Post-It Notes. Behind all these great ideas is the central idea that if you want great photos, you have to be intentional about it. You need to carry your camera with you wherever you go, and you need to plan ahead. You will also learn that the most casual informal shots are the ones you don’t plan.